XS too small but S too loose? Samshek is one of those few brands that understand the troubles of people who have major issues getting their correct size. If you rarely find those perfect fitting stylish clothes then check out this brand right away because they do customizations for all their collections. Whether you’re out for a casual shopping spree or looking for something perfect for your next big party, simply head over to this store and check out what they’ve got and what they can do. And if you’re too lazy to do that, they’ve got an e-store as well. Looking for that perfect outfit for your next Saturday out or office party? We’d suggest you first check out their entire range of chic and elegant western wear because something’s bound to catch your eye. From elegantly striped and ruffled jumpsuits to smart evening dresses and tops - there’s something for every woman - whether you’re an active socialite or corporate power lady or a college student. You can always head over to their store with your design ideas so that their specialists can work with you on creating that special look. The folks at Samshek call themselves a fashion tech store and here’s why. They’ve installed a 3D body scanner technology that takes 100 body measurements in just 5 seconds! 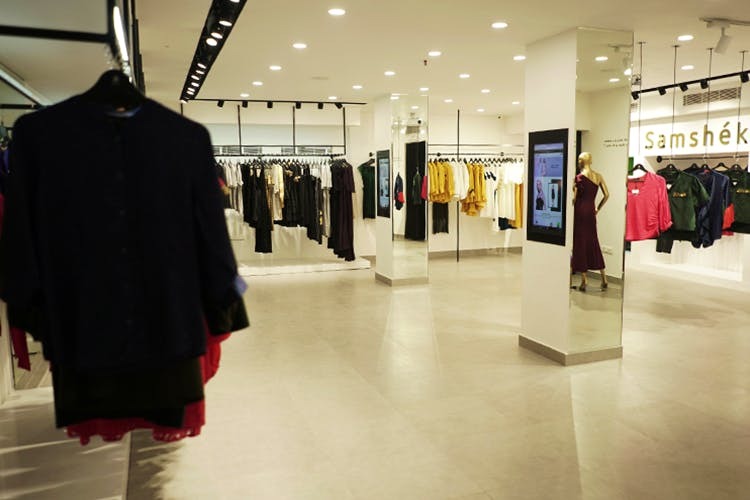 Once the measurements are captured, you can choose and customise your preferred options and outfits either at the screens in the store or from the luxury and comfort of your home. Choose from their collection & watch the magic unfold. Pick a dress, top or a jumpsuit from their RTW range and then create to suit you. You can choose different types of necklines, dress lengths, fabrics and colours. With the help of in-store specialists, you can pick outfits that flatter your body type and fit like a glove. Short on time? Then head over to Samshek’s store because they can make your customised, special outfit within 48 hours. If you’re in no hurry, then you can also order online from their website right here because that takes only 5 days to deliver all over the country - which is not too long of a wait time for e-stores. You can also follow them on Facebook and Instagram to stay updated.